The new book UnMarketing from Canadian viral marketer and Twitter gadfly Scott Stratten takes the rules and purees them, Blendtec style. Unlike so many marketing books, Stratten doesn’t overcomplicate the subject matter. He believes that common sense should prevail, and that UnMarketing success is rooted in the creation of everyday “wow” moments. His self-deprecation adds a hilarious, warm tone throughout. Like Gary Vaynerchuk’s Crush It, Stratten dictated some of the book, and it reads very conversationally. Also, there isn’t a narrative or progression in the book, but rather a collection of 57 short observations, lessons, and anecdotes. For readers that consume material in bits and pieces, this format is ideal. You can easily read UnMarketing over time in 10 or 15-minute chunks. Stratten’s rant against direct marketing – “People still teach courses on how to cold-call better! That’s like finding a better way to punch people in the face” is one of the more memorable examples of his outlook. One of the most commendable aspects of this book is Stratten’s gift for boiling down a marketing principle to its simplest form. His “Pull and Stay” advice; segmenting customers into barrels; platforming; social currency, and other concepts are instantly applicable to real world marketing challenges fitting a wide variety of circumstances. The examples and mini case studies he presents provide insights that leave you nodding your head and thinking you could adopt the same approaches. A tall order, to be certain. I wonder how Stratten feels about companies servicing customers differently, based on their online influence? 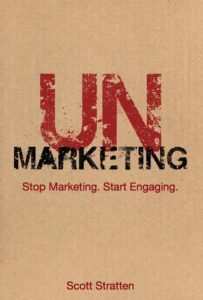 As you might expect, UnMarketing is not your typical marketing and business book. It’s a boullabaise of advice and observations on social media, viral marketing, and customer experience, with a side order of social media how-to. There are a few sections devoted to the mechanics of Twitter, Facebook, Linkedin, and other social media operational specifics. Because they are relatively high level overviews, these aren’t the strongest components of the book, and if you want details on Twitter or Facebook best practices, I recommend Kyle Lacy’s Twitter for Dummies and Mari Smith and Chris Treadway’s Facebook Marketing an Hour a Day. But, if you’re looking for an always-interesting, impactful, funny, practical book to get you excited about marketing again, you should pick up a copy of UnMarketing. Scott Stratten is a compelling character with panache and wit, and he puts these strengths to great use in his first book. He’s on the road now on the UnMarketing book tour of 30+ cities. If he’ll be near you, check it out.